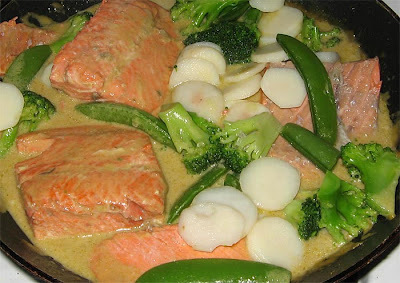 I'm unaware of how often salmon features in Thai cuisine, but I'll go out on a limb and title this "Thai green salmon". In a nutshell, I whipped up some green coconut curry (from a paste base, perhaps over the summer I'll start making my own pastes) and sauteed some salmon steaks in it along with some veg. The red/green color thing gets me jazzed, and the flavor is incredible. Salmon's meatiness and its fattiness combine perfectly with the curry. I highly recommend the combination.